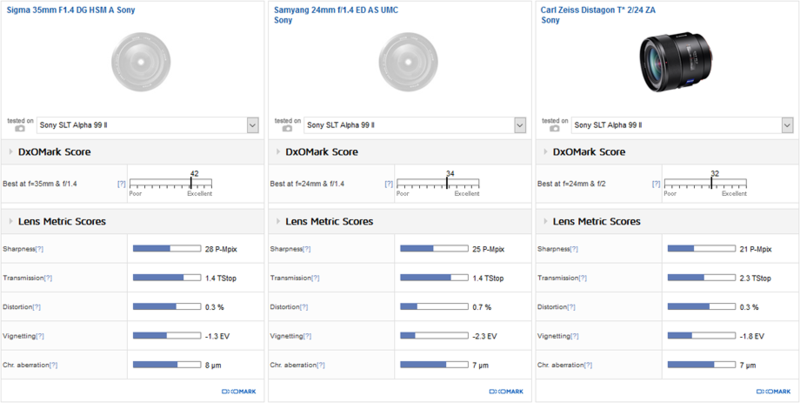 The choice of glass you mount on your DSLR also plays a significant role in image quality, however, and our extensive lens tests provide valuable insight into the performance of lens and camera combinations. 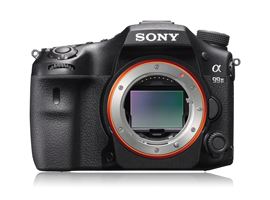 Although it’s fair to say that the number of lenses available for the Sony A99 II isn’t as extensive as those for Nikon and Canon DSLRs, there’s a good range of Sony own-brand lenses, as well as third-party lens options for the A99 II from Sigma, Carl Zeiss, and Samyang. Part 1 of our best lenses review for the A99 II rounds up the specifications and scores for these primes, dividing them in to four categories: wide-angle up to 35mm, standard 50mm, portrait 85-105mm, and super-telephoto primes. Our review takes an in-depth look at the three top-performing lenses in each category, so you’ll be armed with all the information you need when choosing a new lens for your Sony A99 II. A “must-have” optic for shooting landscape, architectural or interior photos, a wide-angle lens as we’ve defined it is one with a focal length up to 35mm on the full-frame Sony A99 II. The wider 20mm and 24mm focal lengths are desirable for much of this work, but 35mm is also a popular full-frame focal length for shooting weddings and environmental portraits, or for street photography. 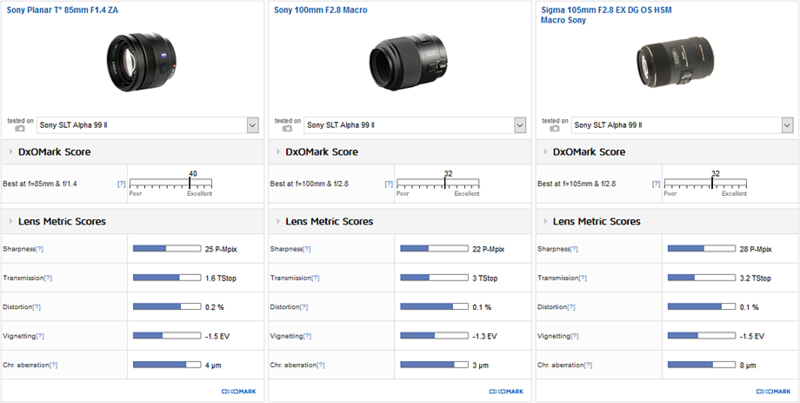 We’ve tested six wide-angle primes on the Sony A99 II, with scores ranging from a high of 42 points for the Sigma 35mm f/1.4 A to a low of 19 points for the Sony 20mm f/2.8. The top three lenses in this category include the $899 Sigma 35mm f/1.4 A, the $549 Samyang 24mm f/1.4 EDD AS UMC manual-focus lens, and the $1298 Carl Zeiss Distagon T* 2/24 ZA Sony. Sitting in Sigma’s high-end range of Art lenses, the Sigma 35mm f/1.4 A is one of the top-performing lenses we’ve ever tested, making it a great wide-angle prime option on the A99 II. If you need a wider field of view, the third-party 24mm Samyang and Carl Zeiss lenses provide a more useful focal length for landscape or architectural work, and boast wide maximum apertures for low-light work, with very good all-around performance, too. Despite all three top-performing wide-angle lenses featuring large maximum apertures, the Sigma 35mm is well ahead for low-light performance, thanks to its excellent light transmission. The Sigma also offers the best or joint scores for sharpness, distortion, and vignetting, and is only fractionally behind for chromatic aberration on the A99 II. For 24mm wide-angle lenses, the cheaper Samyang is slightly sharper than Zeiss overall, but also distorts a little more, with some noticeable barrelling of –0.7% that would benefit from some correction in post-production. All three lenses vignette quite heavily at their respective maximum apertures, but the Samyang is slightly worse at –1.7Ev, which is an important consideration if you’re after a wide-angle primarily for low-light work. In fact, the wider Samyang and Zeiss lenses continue to display corner shading at all apertures, but the issue is much improved using apertures between f/4 and f/22. Results for chromatic aberration are excellent on all three lenses. The Sigma 35mm f/1.4 A is sharpest wide-open, with excellent resolution of around 80% acutance in the center of the frame. It’s a little softer towards the edges at the wider f/1.4 and f/1.8 apertures, but is still very good, and boasts outstanding uniform sharpness using apertures between f/4 to f/11, as well as good resolution of around 70% acutance at f/16. The manual-focus Samyang 24mm displays a similar pattern for sharpness, with softer results at f/1.4, f/2, and f/22, but good levels of uniform sharpness between f/2.8 and f/11, with marginally sharper results than the Sigma at f/4. The Zeiss 24mm isn’t far behind either, with uniform resolution at all apertures; and despite slightly softer results using the maximum f/2 and minimum f/22 apertures, it boasts excellent sharpness of over 70% acutance between f/2.8 and f/11. For an ultra-wide field of view, the Sony 20mm f/2.8 is the widest prime we’ve tested on the A99 II. Unfortunately, it’s the lowest-scoring, too, with some heavy corner shading of –2.4Ev at the maximum aperture, and –0.8% barrel distortion creating some noticeable curvature to straight lines. Heavy chromatic aberration, or fringing, occurs at all aperture settings, too — although to be fair, it’s restricted to the very far corners. At the maximum f/2.8 aperture, the Sony 20mm has relatively poor outer field sharpness with notably soft edges; and although resolution is much improved between f/5.6 and f/11, it’s not uniform at these apertures, either. Standard 50mm prime lenses offer a field of view akin to human vision and a useful focal length for a variety of subjects and general use. They also offer “fast” apertures for low-light photography and creative bokeh effects, often in a reasonably small and affordable unit. 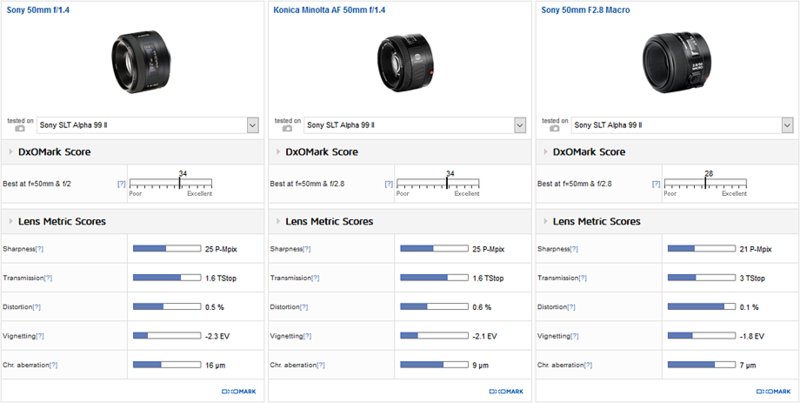 We’ve tested a total of three 50mm primes on the Sony A99 II, with scores ranging from a high of 34 points for the $448 Sony 50mm f/1.4 and the now-discontinued Konica Minolta AF 50mm f/1.4, to a low of 28 points on the $498 Sony 50mm f/2.8 Macro. The two large f/1.4 maximum aperture 50mm lenses win overall, thanks to their better light transmission and low-light performance on the A99 II compared to the 50mm f/2.8 alternative. The Sony 50mm f/2.8 boasts a 1:1 macro option and 20cm minimum focusing distance, however, which makes it an interesting alternative for general photography, portraits, and close-up photography on the A99 II. The Sony 50mm f/1.4 displays a bit of barrel distortion at –0.5%, which is unusual for a lens of this type, as well as some noticeable chromatic aberration in the outer field at all apertures. By comparison, the 50mm f/2.8 offers less distortion and fringing, and although both 50mms vignette fairly heavily at their respective maximum apertures, closing down a couple of stops all but eradicates the problem. For resolution, the Sony 50mm f/2.8 is sharp in the center of the field when shooting wide-open at f/2.8, but a little softer at the edges; it hits peak sharpness between f/5.6 and f/11, with uniform sharpness of over 70% acutance. For long depth-of-field macro shots, its f/32 minimum aperture also offers uniform sharpness, although overall resolution is a little softer at around 55%. In comparison, the Sony 50mm f/1.4 offers relatively poor edge softness at its maximum f/1.4 and f/1.8 apertures, which is a little disappointing if you’re primarily after a fast standard prime for low-light or creative depth-of-field shots. Resolution is much improved between f/2.8 and f/11, however, where it offers uniform sharpness of over 70% acutance across the entire frame. Portrait lenses offer a short- to mid-telephoto focal length between 85mm and 105mm that compresses perspective and keeps facial features in proportion. Fast-aperture versions are also useful for isolating a portrait by throwing the background out of focus, and they can be useful lenses for documentary or reportage photography in such low-light environments as weddings and indoor or evening events. We’ve tested a total of four 85–105mm portrait lenses on the Sony A99 II, with scores ranging from a high of 40 points for the Sony Planar T* 85mm f/1.4 to a low of 29 points for the Sony 85mm f/2.8 SAM. The top three performers include the fast-aperture $1698 Sony Planar T* 85mm f/1.4, as well as two longer-focal length macro options, the $748 Sony 100mm f/2.8 Macro and the $619 Sigma 105mm f/2.8 EX DG OS. The more expensive Sony/Zeiss option wins overall, thanks to its improved light transmission and low-light performance, making it an excellent option for creative portraiture, low-light, and event photography on the A99 II. At less than half the price, however, the cheaper Sigma and Sony options are still excellent portrait options, offering close-up photography with 1:1 macro magnification at their minimum focus settings. The Sigma 105mm f/2.8 also boasts image stabilization (OS), which is an important feature on a lens of this type — and particularly so for macro work using smaller apertures without a tripod. The Sony 100mm closes down to a minimum f/32 aperture, however, which is also beneficial for macro photography, allowing you to capture greater depth-of-field focus when working at such close proximity to your subject. All three of these portrait lenses vignette a little bit at their respective maximum aperture settings, but closing down a stop significantly improves the issue. Chromatic aberration isn’t a problem at any setting, nor is there any problematic distortion (as you might expect for lenses with these focal lengths). For sharpness, the Sigma 105mm f/2.8 offers the best overall resolution, with excellent results of over 70% acutance between f/2.8 and f/11. For long depth-of-field macro shots, the Sigma’s resolution is a little softer at f/22, as you’d expect with diffraction, but still offers very respectable results of around 60% acutance. For creative shallow depth-of-field portraits and headshots, the Zeiss is very good wide-open at f/1.4, with uniform resolution around 65% of acutance. It hits peak sharpness between f/2.8 and f/11, where it offers outstanding and uniform resolution of over 70% acutance, with again slightly softer results at f/22. The Sony 50mm f/2.8 is also very good wide-open at f/2.8, and particularly strong in the center of the frame at this setting, although not truly uniform. The Sony 100mm f/2.8 records excellent and uniform resolution of around 80% acutance using apertures between f/5.6 and f/11, however, with respectable accutance results of around 55% at f/32, too. The preserve of the professional photographer, or of the extremely serious sports and wildlife enthusiast, these super-telephoto primes combine very long focal lengths with large maximum apertures to help you achieve fast shutter speeds in all lighting conditions. As a result, telephoto primes are necessarily large, heavy, and expensive, featuring big, high-quality glass elements that push super-telephoto lens prices into several thousands of dollars. In fact, the Sony telephoto primes are particularly expensive, with price tags of $7498 for the Sony 300mm f/2.8 G II and a whopping $12,998 for the Sony 500mm f/4 G SSM, compared to $5597 and $10,297 for the equivalent Nikon 300mm and 500mm alternatives, respectively. Neither of these Sony telephoto options offer lens-based image stabilization, which is an unusual omission for a lens of this type, although with the built-in 5-axis Sony SteadyShot INSIDE sensor shift system incorporated into the A99 II’s body, it’s less of an issue for Sony shooters. 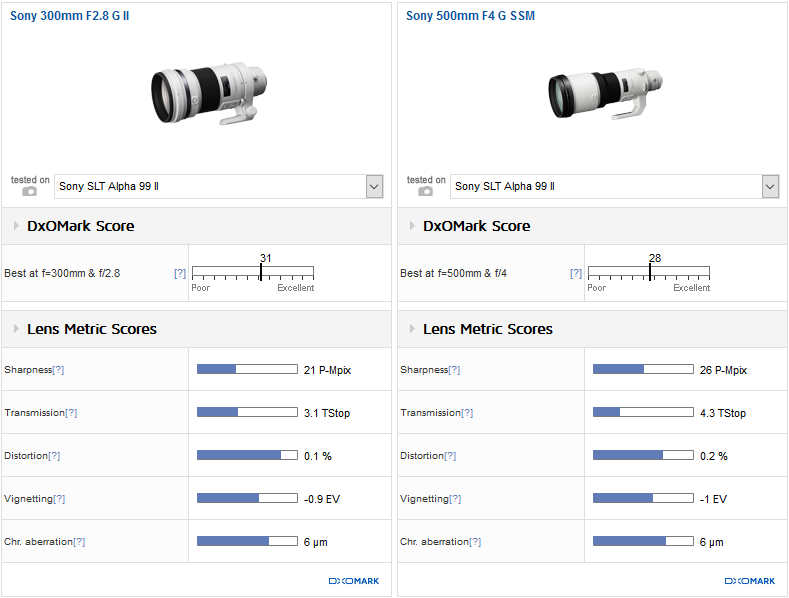 The Sony 300mm f/2.8 G II wins overall, thanks to its better light transmission and low-light performance, despite better overall sharpness on the 500mm f/4 G. There’s no distortion or chromatic aberration to worry about on these top-end telephoto primes, and although a little mild vignetting occurs at each lens’s respective maximum aperture setting, it’s not concerning and all but eradicated by closing down one stop. Both offer very good sharpness, but the 500mm f/4 G is exceptional between f/4 and f/11, with high levels of uniform resolution well over 70%. The 300mm f/2.8 G is a little softer at its wider f/2.8 and f/4 apertures, but still has very good acutance of around 70%; it hits peak sharpness of well over 70% acutance at f/5.6.